TULARE, CA (KMJ) – A Visalia gang member is sentenced to life in prison for murder. On Tuesday, at the Tulare County Superior Court, Judge Kathryn Montejano sentenced 28-year-old Apfu See to 124 years-to-life in prison. 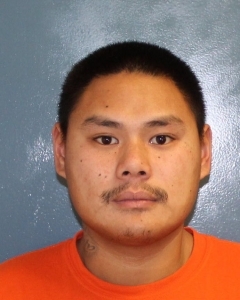 On March 4, 2019, the judge found See guilty of first-degree murder, attempted murder, and shooting at an occupied vehicle, each count was enhanced with the special allegation that a firearm was used. See was also convicted of arson of a vehicle, and possessed a prior strike for assault with a firearm in 2008. Just after midnight on October 17, 2016, Visalia Police responded to the Flyer’s gas station on Mineral King Avenue and Ben Maddox regarding a shooting. Two men were discovered in a car; one was dead from a gunshot wound to the head, the other man was shot in the knee. Video surveillance showed the deceased victim walking out of the store followed by See. When the victim got in his car, See pulled a handgun from his waist and began shooting into the car. He then jumped into a white van driven by co-defendant 20-year-old Edgar Cardenas, and sped away. A short time later, the California Highway Patrol and Tulare County Fire responded to Road 112 in Visalia and found the van fully engulfed in flames. Through their investigation, detectives identified both See and Cardenas. See was arrested at a Hanford restaurant on October 21, 2016. See pleaded no contest on June 15, 2017, to arson with the special allegation of street terrorism and accessory after the fact with the special allegation of being armed with a firearm. He was sentenced to 8 years and 8 months in prison.